‘Splitsville’ definitely lives up to the expectations set by the first in Christina McMullen’s ‘Rise of the Discordant’ series. Now that we’re familiar with the town of Blackbird, we can really start getting caught up in the lives of the folks protecting it from the Discordant. It was already pretty easy to find Seth and Desmond endearing, from the beginning of the first book. When the freshly dead teenaged twins show up, to act as the town’s Guardians, they end up presenting the possibility of being the most fascinating of the bunch. That’s quite a lot to say, considering what kind of characters inhabit Blackbird. Jem and Nai are not like other twins; they are two fragments of a split soul, one of them tending toward light and the other toward darkness. Nai is the dark one, and she hates the joke that is her and her brother’s names as much as I loved it. Jem is too bright and optimistic, just like he ought to be. It was very easy to get attached to both of them quickly, but Nai was my favorite of everyone by the time I was halfway through the book. It’s hard to say if I was hoping she would stay out of trouble or get into more, but I definitely couldn’t wait to find out. Honestly, I was relieved to discover that the book title didn’t refer to Desmond and Seth going their separate ways; that would have been pretty devastating, just after they’ve found each other. 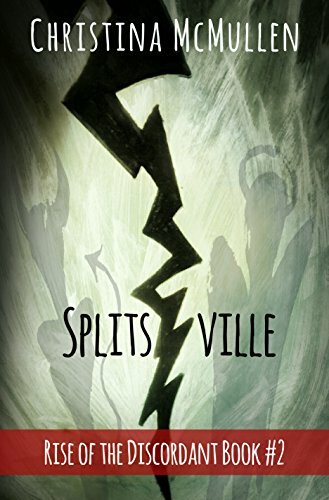 ‘Splitsville’ doesn’t just add another book to the ‘Rise of the Discordant’ series; it adds another level to every aspect of this story. Each compelling character is continually revealed, bit by bit, as is the nature of the town and its other inhabitants. Reading one of these is just going to make you want to read all of them, which is what I plan to do. One thing I want to make sure I mention is the perspective from which this series is written, because it’s pretty amazing in and of itself. McMullen jumps smoothly from one perspective to another, telling each character’s version from the first person point of view. The reader gets to see what each of them sees when they look at the world, and scenes overlap from one perspective to another seamlessly. Although the shift in perspective isn’t identified with names or catchphrases, the reader immediately knows whose eyes they are seeing through. On top of being a great story that leads naturally into the next while still being completely satisfying in itself, this series is artfully told. So far, every book I read by this author has had something unique and powerful to say while fleshing out endearing and lifelike characters. I will definitely be coming back to Blackbird, and doing my best not to draw any erroneous conclusions about what the rest of the titles might mean. I highly recommend this series to anyone who enjoys the idea that other worlds live alongside ours, in any way. The team of supernaturals that have come together to battle Chaos in this story is bound to win your heart, and have you aching to know what happens next. You’ll find ‘Splitsville’ at the Kindle store and on Kindle Unlimited, along with the rest of the ‘Rise of the Discordant’ series. ← Thoughts That Hurt To Think #008 – They’re Eating Our Pets!